You'd think with all the solutions contained in The Little Red Book of Sales Answers that anyone who listens to it would automatically become a better salesperson. You'd be thinking wrong. To become a better salesperson, the first thing you have to do is listen to it. The second thing to do is listen to it again. The third thing to do with this is try one answer everyday. If it doesn't work exactly right the first time, or the outcome wasn't what you expected, try it again and tweak it a little bit. The fourth thing you have to do is practice the answer until you feel that it's working. The fifth thing you have to do is become the master of it. 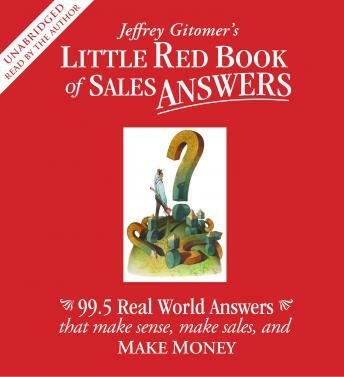 In his Little Red Book of Sales Answers, Jeffrey Gitomer allows you to blend each answer to your selling situation and do it in a way that fits your style, and your personality.